I have developed a new passion for these little mini books. 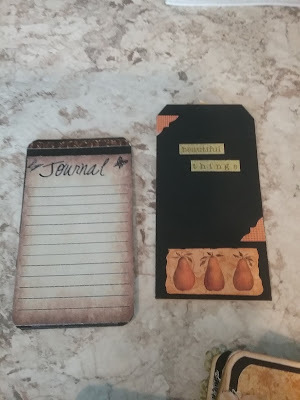 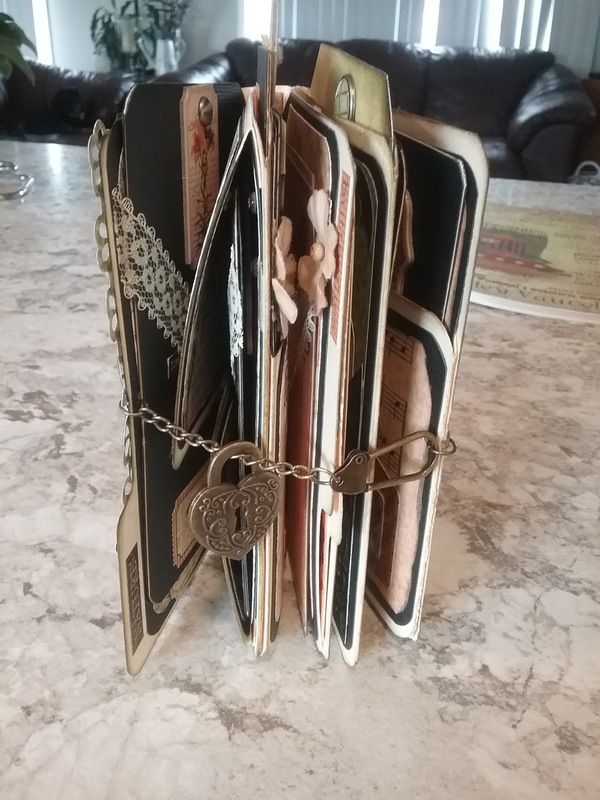 They can be used to keep photos or to journal in. 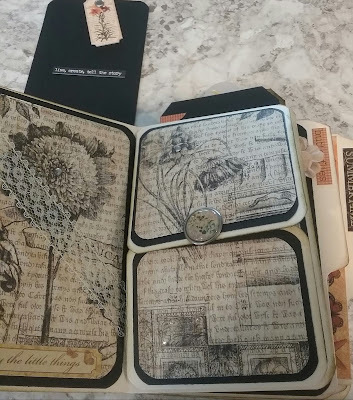 They make nice gifts. 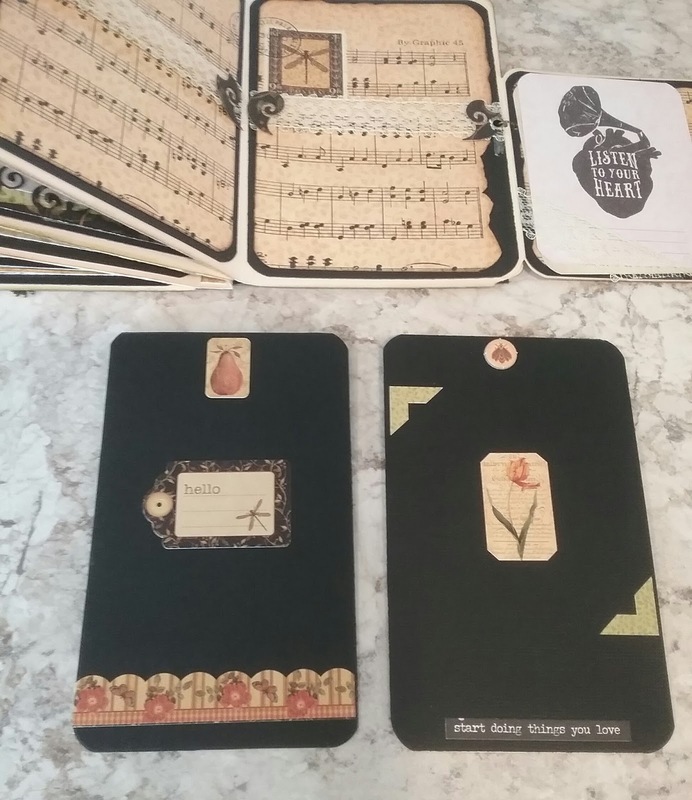 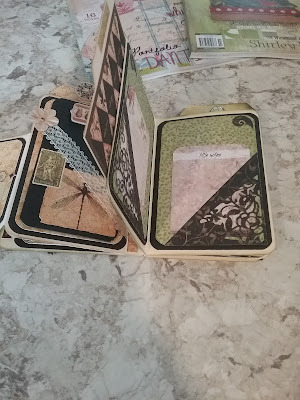 I love the Graphic 45 collections for these books as they have every thing you could want for decorating the pages and tags. 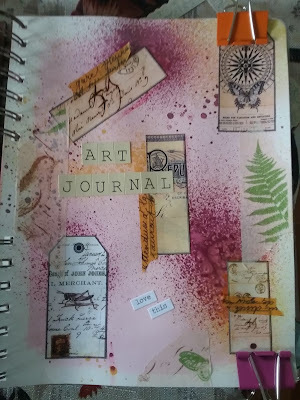 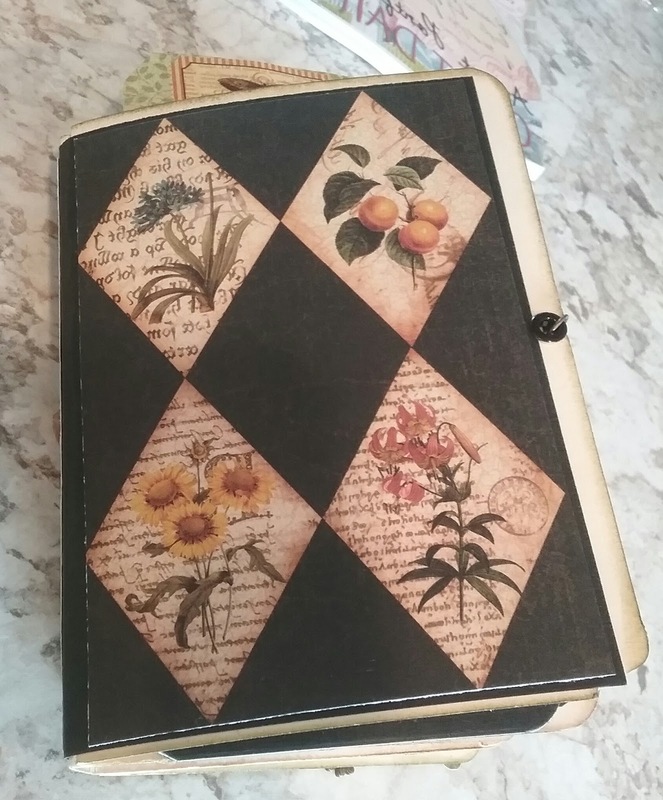 This book was made using the Botanicabella Collection. This is the front cover. 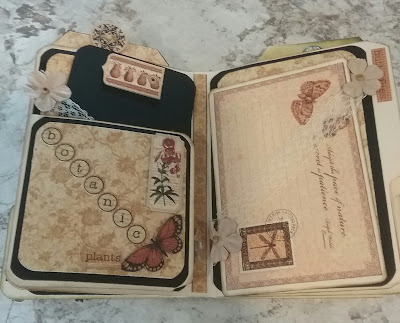 There are butterfly cut outs, flowers, a die cut flower border and a metal frame with the word Dreamy inside. and this is the same page with the tag removed. 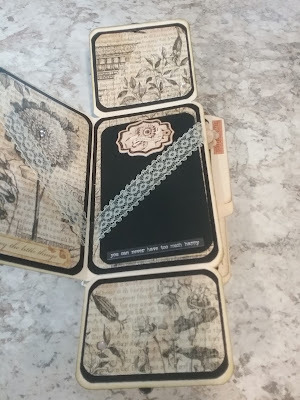 A piece of lace is used to hold the photo mat in place. Here is the same page again with the bi-fold flap opened to reveal another tag or photo mat. 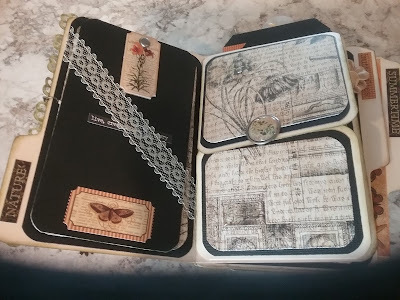 This is a shot of the whole page opened up with two tags. 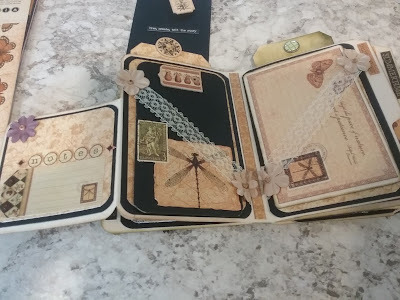 This next page has two corner lace die cuts to hold the note cards as well as a side pocket on the left for a large tag. 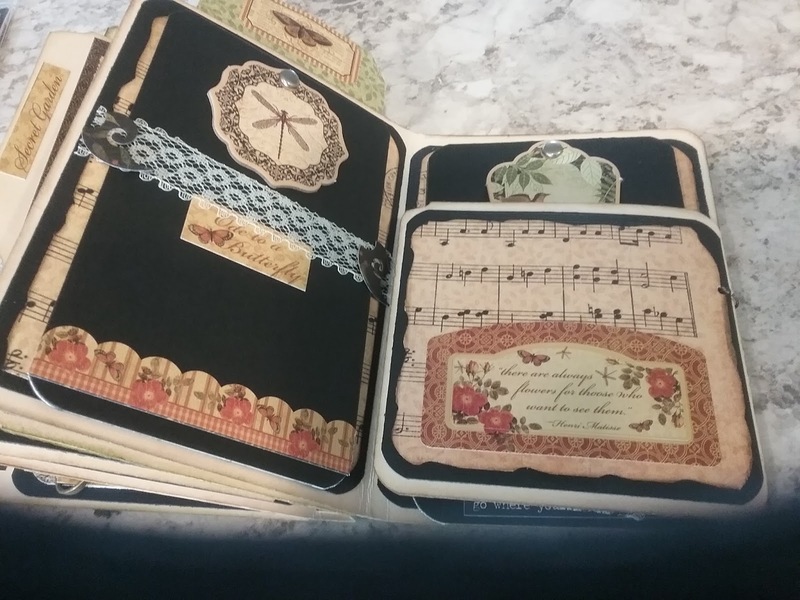 This page has a 1/2 flap on the right and a photo mat on the right. 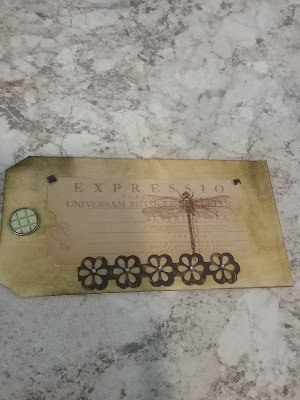 These are some of the tags in the booklet. 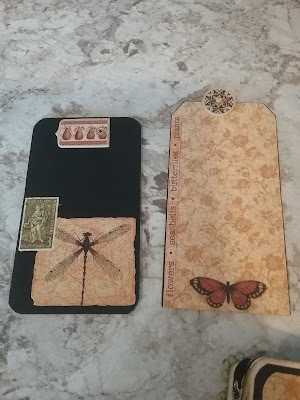 This tag uses a sticker from the G45 Oddities collection but the dragonfly matched the Botanicabella collection perfectly. 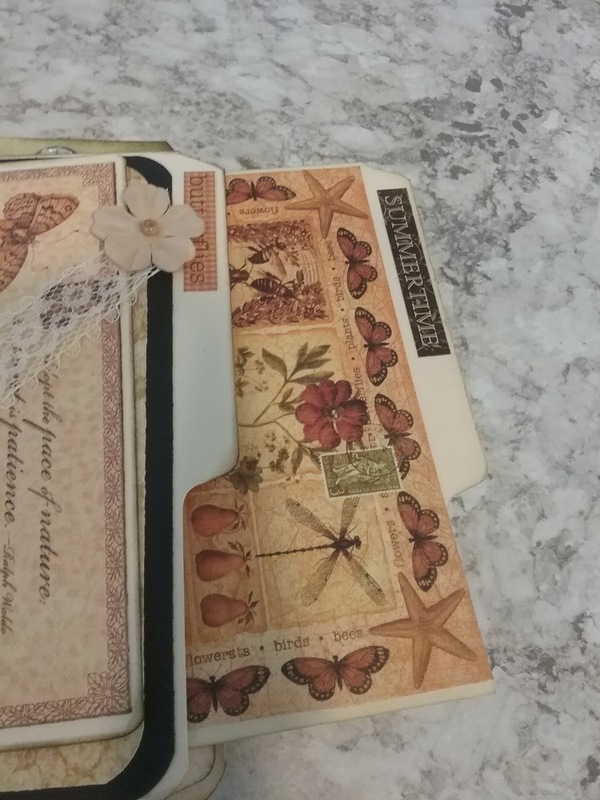 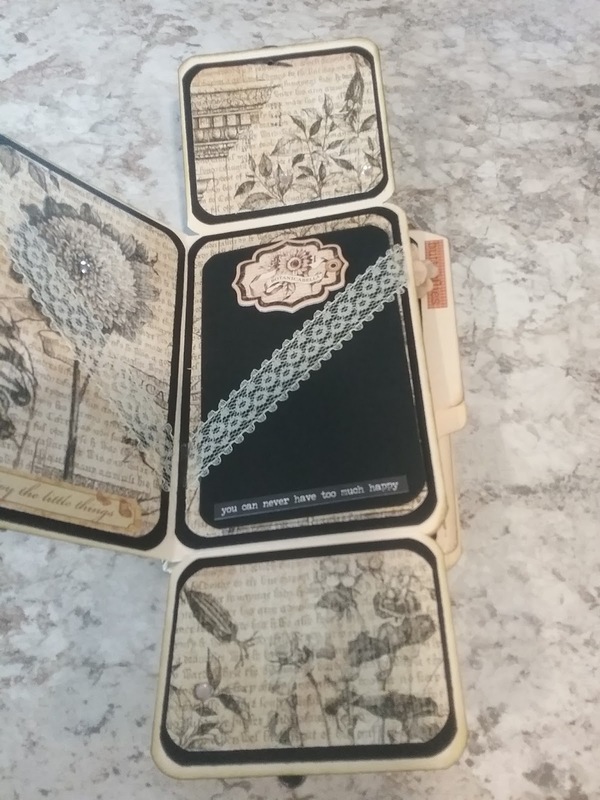 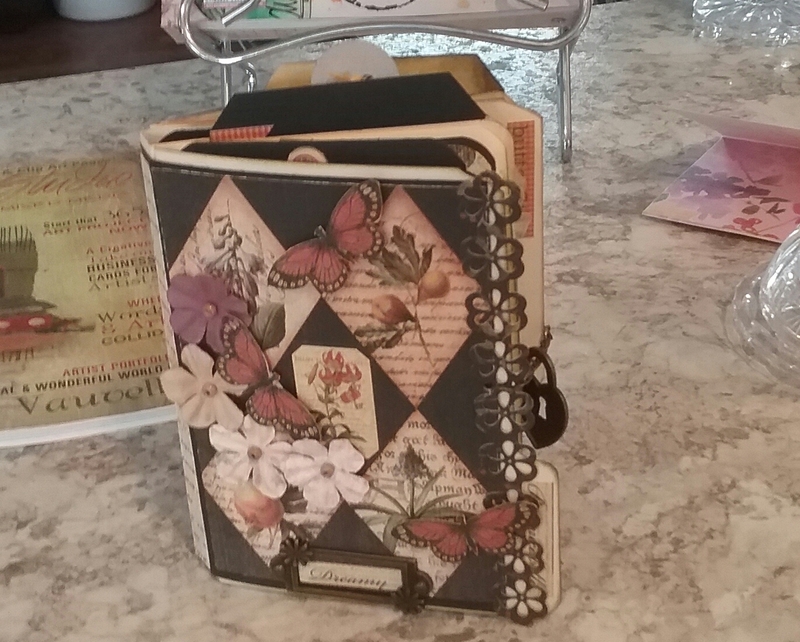 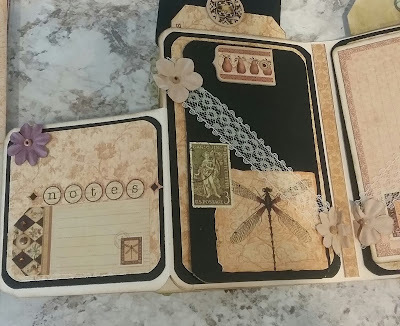 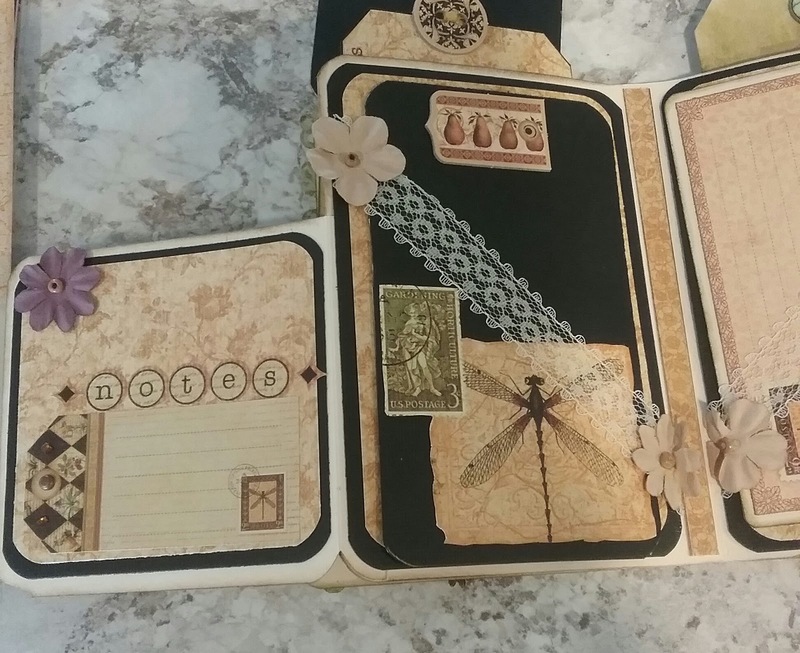 I used black cardstock for matting and Inked the edges of the pages with Tim Holtz Distressed Ink. 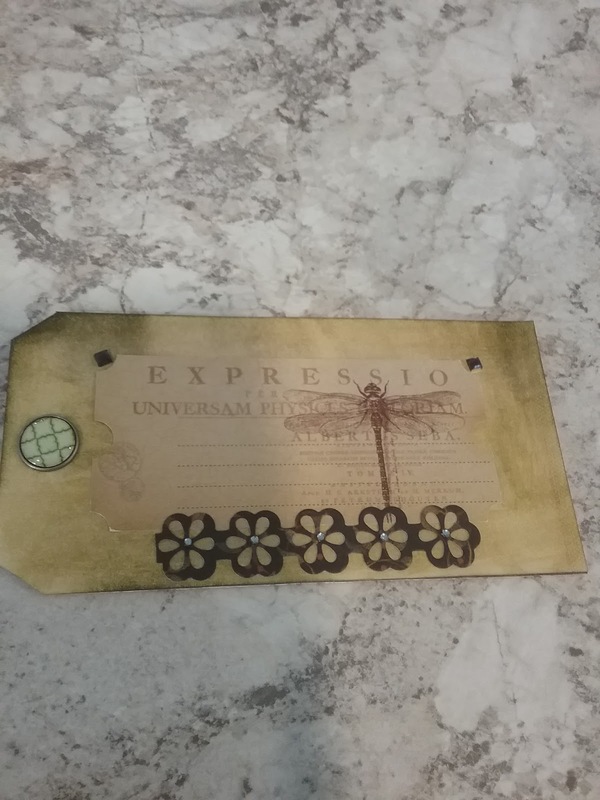 I also used some decorative brads on the tags.